I’ve noticed the very utterance of the name “Hawaii” often sends surfers into either one of two reactions: pure froth or pure frustration. Like that one who got away or that one you’ll never forget, Hawaii has a tendency to have these effects on surfers alike, although I’m no well Hawaiian-ized surfer gal. Yes, I have surfed Oahu’s Waikiki a few times, but never the famed and over-photographed North Shore. And more recently, I can now add the Big Island to my list of “have surfed there” spots, namely a not-so gentle break called Kahalu’u located in Kailua-Kona. The Big Island is, so far, my favorite spot out of the three Hawaiian islands I’ve visited—Kauai, not included above because I did not surf there. As a pasty gal from the mainland innocuously asking random locals for a nug of info about surfing in Kailua-Kona, I was met with more discouragement than anything. 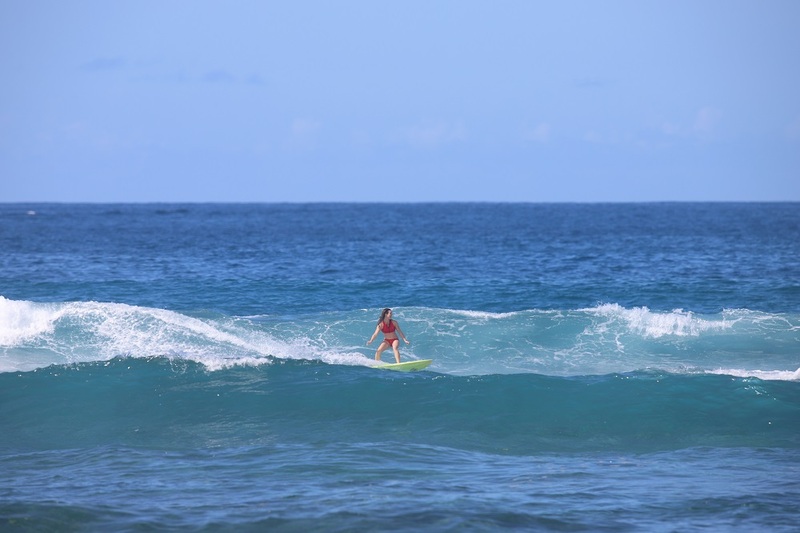 At first, I wanted to blame it on the fact that they just didn’t want a mainlander to take their waves, but as I learned, the big island locals and I share similar sentiments about sharing waves and wave-hog tourists. Here are some tips for fellow mainlanders and anyone else who thinks about surfing the Big Island. 1. It is reefy—not rocky, well, yes, razor sharp LAVA rocks make up the majority of the island’s beach landscape. However, once you paddle out, don’t forget to look into the water to double check for reef that is pretty much everywhere. Right up there with lava, reef can be ultra-sharp, so it is in your best interest not to eat it feet or head first on waves (see number “4”). A Kona reef doing it’s thing. —as one local lady told me with some serious ‘tude to boot: “this ain’t Waikiki…the locals wait all year for their waves.” And, thanks to our LA-folks, out-of-town people have inherited a reputation for wave hoggery. Once again, LAliens, THANKS. This ain’t a competition…wait your turn on the shoulder or hang out in the channel and watch the locals put on a clinic. If you show some respect and not paddle straight to the peak, they will most likely let you catch a few, but don’t paddle out thinking you’re going to take every wave. When I checked Oahu’s surf report and compared it to the Big Island, I noticed Oahu gets far more (and bigger) waves, so these locals are HUNGRY. Let them gorge themselves before you start nibbling at the peak. Oh & avoid the “Billy Badass” attitude—pretty sure that gets you nowhere. Show the locals some R-E-S-P-E-C-T! —as I mentioned above, avoid the “Billy Badass” attitude. Billy Badass goes nowhere with Hawaiians. These are some of the hardest-charging surfers I’ve ever seen, so just because you’ve surfed double-overhead El Porto doesn’t mean you get to take everything that comes your way. The question is not whether you can surf, it’s whether you can take the time to respect the locals and the wave. During the winter months, Kailua-Kona is a little less exposed than it’s neighbors, like Oahu and Kauai, so the swell is little less consistent and, while it’s still pretty damn impressive, the size was not as significant as the neighboring islands. The locals need their waves and it would behoove you to let them gorge before they have to go to work or home. Nothing worse than a grumpy local, right? Take the back seat and let the locals have their waves first…and don’t be a jerk about it. I played nice and the locals played nice back. Reaping the rewards. –to state the obvious, if you are surfing over reef, which is a living, breathing organism/ecosystem, be sure to “starfish” when you eat crap. Unless you want French fries for toesies, or want to find out what it feels like to have your skull pierced, make sure to flatten your body or aim that bootie towards the water, if you can help it. I was specifically told by the locals to not eat it feet or head first. Although they told me that there is a slight buffer between the white wash and the reef (apparently you are more likely to roll over the reef rather than straight down to the bottom), it’s always good to exercise caution and give the seasoned local a good chuckle and flatten out as much as possible. Take a page from that epic T.V. show ‘Sponge Bob’ and absorb your best Patrick impersonation. In the interim, try not to belly-flop. —Mini-story time! Despite the fact that I ran into a lot of discouragement from some locals, surfing was going to happen, come hell or double over-head high water. Kahalu’u had piqued my interest after I tried to paddle into the wave during a building swell and a dropping tide. At the wave’s peak during the low tide, the wave turned into a mutant exposing dry reef and the drop-ins looked damn near impossible. So, I sat on the shoulder, told myself I was being polite for the locals while my heart pounded in my chest and waited patiently for a small-ish shoulder to come through in between thumping well-overhead sets. Kona Boys rented me this pintail beaut for my last day to surf Kahalu’u. Very stoked surfer girl. 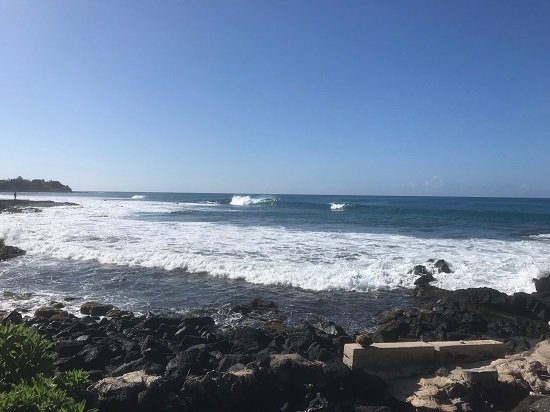 Over the next couple of days, the swell climbed to double-overhead and all along Ali’I drive in Kona, the reefs were seen straightaway from the road firing on all cylinders while lifeguards posted red flag warnings. I really wanted to surf one more time, even tho I was scared shitless of the wave. I just wanted to give it another go. I found another place to rent a board right in front of Kahalu’u, but “because the conditions were red flag,” the shop refused to rent me a board because they didn’t want to be held liable. In the meantime, I watched them rent a SUP to a 10-year old—an excellent way to make my blood boil. I was so put off …I felt sized up…angry…discouraged…I tried to look beyond their blatant rejection and obvious “see you coming” attitude, but only saw red. 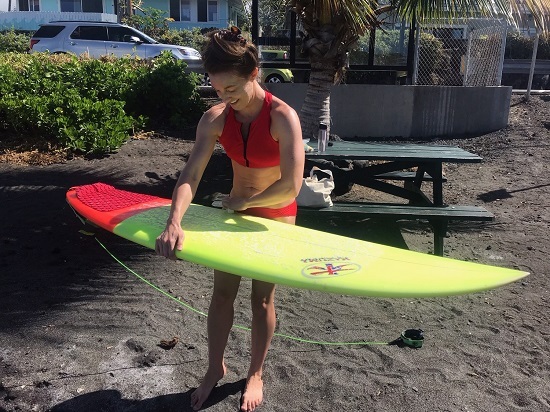 After some encouragement from my boyfriend, I picked up the pieces of my shattered ego and rented a stunning board from Kona Boys Surf Shop—polar opposite experience. In the end, I scored some great waves and the locals, who had come to refer to me as “Trestles,” were hooting me into sets. I left the water with the biggest smile I’ve had in years for surfing. Don’t give up. After a surf, I highly recommend trying out Da Poke Shack off Ali’I drive. It will ruin any inkling of “fresh fish” you’ve ever had, even if you live by a coastline…on a boat…or in the sand. I watched them slice and dice the fish, which (sorry vegans! ), was a beautiful array of hues ranging from deep blood to bright red. On our first attempt to find the place, we arrived just in time for them to sell out–it was noon.